Stony Brook, NY, October 11, 2017 - Earlier this year when Sea Grant was called into question in the federal budget proposal, many spoke out in support of the 50+ year national program. That's because in that time the National Oceanic and Atmospheric Administration's (NOAA) National Sea Grant College Program (NOAA Sea Grant) has been putting science to work for America's coastal communities. “Sea Grant has been working with a wide assemblage of partners to support New York’s coastal communities, businesses and residents for five decades now," said New York Sea Grant Director William Wise. 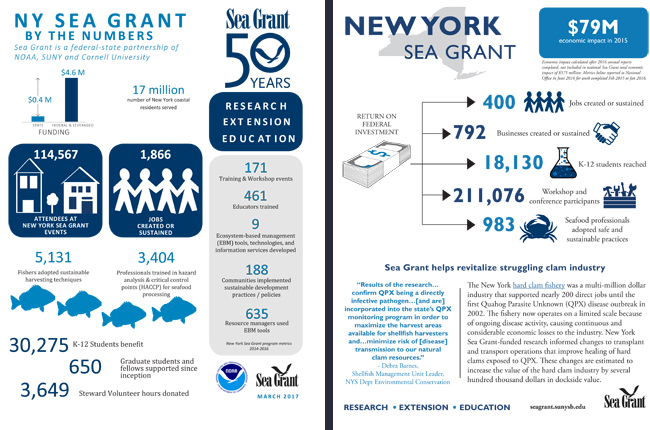 "Thousands of New Yorkers have benefited over the years from Sea Grant programming in such areas as fisheries, aquatic invasive species, coastal tourism and coastal community resilience." Sea Grant partners on a number of efforts with SRIatJB, a Brooklyn College-based non-profit that provides funding for projects such as research on horseshoe crabs on Plumb Beach, shellfish functionality and algal blooms in Jamaica Bay and Long Island Sound, and nutrient cycling on Long Island. Fulton biology high school teacher Dan Mainville, who attended the training, said the information and expertise Sea Grant provides for the communities they serve is worth the investment. "I mean how do you replace that? I don’t think you can," Mainville said. "To remove that funding is ridiculous - counter-intuitive." Kristin Scheehan-Vautrin, who teaches life science and environmental science in Pulaski, said the cuts would be a huge disservice to the nation's future. "I think there’s a huge disconnect for students between what they know about nature and their experiences with it," Scheehan-Vautrin said. "I think a lot of these activities allow the students to have experiences – not only outdoors, but learning about their natural resources -- and I think that’s the only way they can become a good steward for those natural resources is by having those experiences." 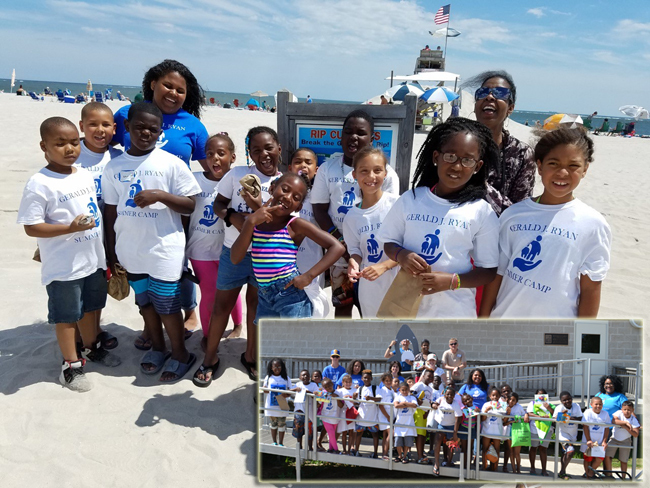 Helen Domske, New York Sea Grant's coastal education specialist, says these workshops and resources help teachers find ways to reach thousands of students. 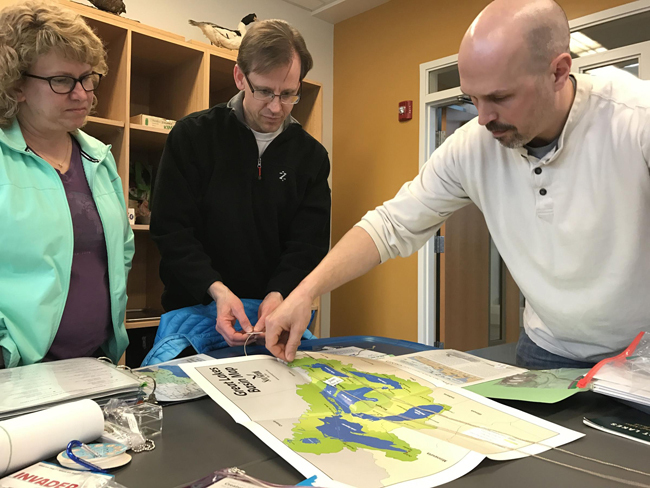 "We’re trying to get teachers excited and interested in the Great Lakes so they can share this newfound information with their students and get them excited because they are the next generation of scientists," said Domske. "So if we don’t get them trained and interested, the lakes won’t have the protection they need." 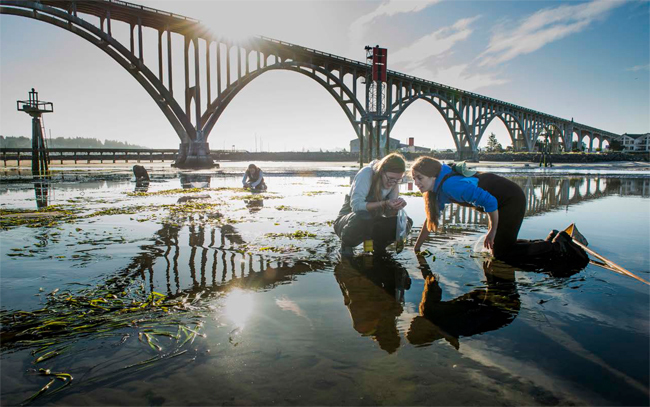 In addition to education services, Sea Grant personnel also provide information and research to local governments and institutions that are tasked with preserving the Great Lakes and their resources. "A lot of the projects we are doing now looking at impacts of extreme weather, changes of lake levels on shorelines - these kinds of projects are really important, not only to scientists or the community members, but the land owners who are getting their information from us and those we have educated," said New York Sea Grant associate director Kathy Bunting-Howarth. 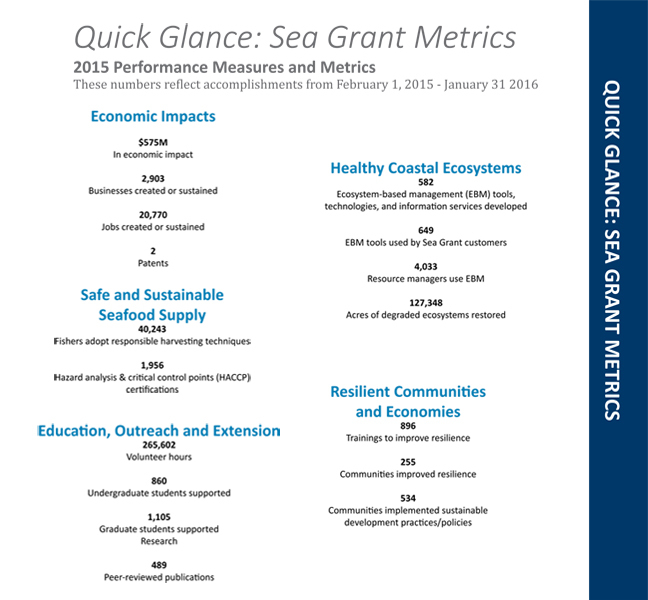 The Federal Administration's budget plan says Sea Grant is a low priority that primarily has a state and local impact. 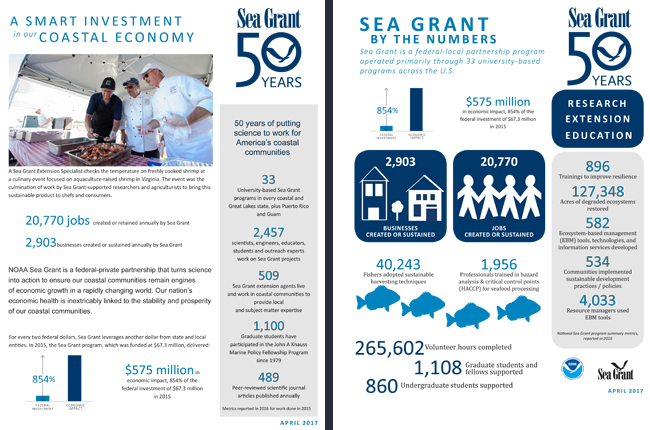 But Sea Grant's fisheries expert Jesse Lepak says the program has leveraged millions of dollars in economic impact and created thousands of jobs during its 51-year lifespan. "I think one-fifth of the world’s fresh water is a resource that we really need to take care of and realize how important it is," Lepak said. "Sea Grant has served and continues to serve a wide variety of coastal stakeholders," she wrote. "New York Sea Grant conducts workshops and trainings vital for over 114,000 boaters, recreational fishing-related businesses, and anglers annually." "Sea Grant works hand-in-glove with marine recreational businesses, for-hire boats, and bait and tackle shops, to develop innovative marketing approaches to secure a steady stream of clientele at a time when some say participation rates in marine recreational fishing are declining. 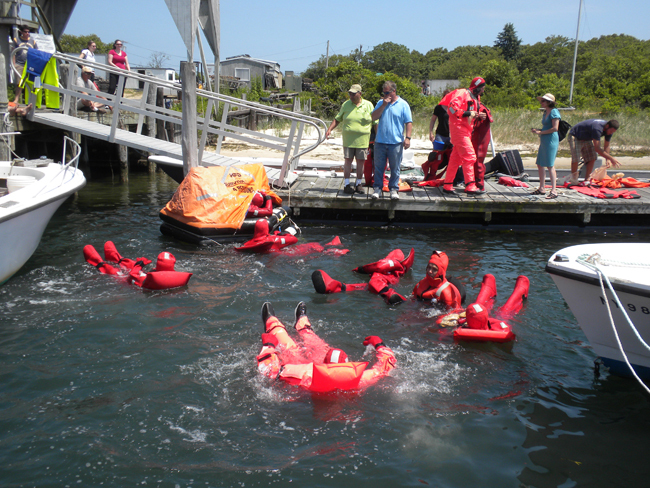 New York Sea Grant offers certifications for lifesaving safety for commercial anglers and boaters ensuring that those who leave the dock return to the dock. After Sandy, Sea Grant worked with marina operators to access the disaster relief and rebuilding funds that became available. As a charter boat captain, the safety of my passengers and crew is paramount and is dependent on accurate weather information. Sea Grant’s work on issues of coastal hazards, severe storms, and shoreline resilience is critical." To read Cannon's full letter, click here (pdf). New York Sea Grant maintains Great Lakes offices at SUNY Buffalo, the Wayne County Cooperative Extension office in Newark and at SUNY Oswego. In the State's marine waters, NYSG has offices at Stony Brook University and Stony Brook Manhattan, in the Hudson Valley through Cooperative Extension in Kingston and at Brooklyn College. For updates on Sea Grant activities: www.nyseagrant.org has RSS, Facebook, Twitter, and YouTube links. NYSG produces a monthly e-newsletter, "NOAA Sea Grant's Social Media Review," via its blog, www.nyseagrant.org/blog. Our program also offers a free e-list sign up via www.nyseagrant.org/coastlines for its flagship publication, NY Coastlines/Currents, which is published 1-2 times a year.